Phew, I'll finally be able to change my macro to "/yell Mount the core hounds!" As A BM hunter with the Core hound as a pet and the Core hound pup vanity pet , this could look pretty epic. In speculation, core hounds do not have much relevance to the plot of draenor...Except for in Upper Blackrock Spire, which will have a new core hound called Son of The Beast... It's possible that said corehound will be the candidate most connected to the mount. Perhaps a drop from Zaela? Or, if we're not so fortunate, it will just be another blizzard store mount. Update: I suppose I couldn't have guessed it myself, but the mount will actually be a reward for defeating Ragnaros in the 40-player Raid Finder version of Molten Core, which will be available for the WoW's 10th anniversary event. How do we get one? Drop? Rep? Clicking on the View in 3D, as of this current time while Warlords of Draenor is in it's beta, is a white stallion, which looks to be the retired mount, "White Stallion". Everything seems to point to a store mount, especially after Blizzard's comments about "not having enough resources" to introduce many new mounts into the actual expansion. Currently in the WoD Beta you can go into your mount journal and look at the Core Hound mount. There is speculation that it WILL be at drop since in the journal it says "Drop: Take a Guess". "Downing the Firelord will earn you an Achievement and a special Core Hound mount reward (fireproof leg armor not included)." Ride you own The Beast! Why not a three-headed dog like Cerberus? Perfect choice for any scary and agry warlock. I have a feeling this may be a dungeon achievement reward, considering that all of them are red. Hopefully this is not a store mount. That would be so disappointing and lame. The new Core Hound mount will most likely be yet ANOTHER store bought mount. Blizzard really, really, needs to give it a rest on store bought crap. The displayID currently associated with this mount is the White Stallion, so if you click on View 3D currently you will see a horse. However, you can view the correct 3D Model on our newspost. I hope this isn't the final animations of it. The chains on top are not very logically connected and they stretch in the animation. Cool i hope they make taxi mount out of it! I immediately thought it'd be another mount from the store, but unlike every other mount from there it requires level 60 instead of 20. This might be an indication that it has another source. It definitely got my hopes up again. I wonder why my last comment got thumbed down. I was trying to be informative, and my comment was correct, as there was no other comment saying the 3D view is the white stallion, until the Sticky comment showed up. It could be a possible new drop from Molten core that they'll add to either Ragnaros or Magmadar! trully amazing Blizz added this mount ! According to the 10 year anniversary announcement, this will be a reward from killing Ragnaros in the special 40-player Raid Finder version of Molten Core, along with an achievement. Earned through a special 10 year anniversary 40 man raid finder to do Molton Core. Kill Ragnaros to get an achievement and this beastly mount. Update! 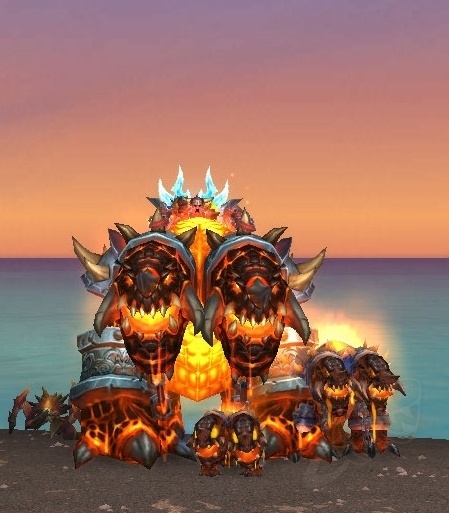 The core hound mount has been announced as the reward for defeating Ragnaros in the 40 Man LFR version of Molten Core as part of Blizzard's 10 Year WoW celebration. You also get the Molten Corgi just for logging in, and there will be a new battleground that will bring back the classic battle of Tarren Mill vs. Southshore. I thought the fall of Gnomeregan quest at the end of wrath was pretty cool when we got the transformation item Stolz von Gnomeregan also the Theramore scenario at the end of cata with its Wappenrock von Theramore but this... this beats them all. i just hope the event (and the possibility to get the mount) will last more than the usual 1 month after/before the celebration date. also hope blizz will make other versions of this mount to buy/drop/win in some other way so that people who will miss the event will be still able to get a similar mount. Blizz can u hear me? It's about time, my core pup has been compact car size for years now. Will this mount be that awesome as it seems? Will our adventurers get this before the release of WoD? All the questions and more, will be answered this thurday at Gamescom! Awarded to those who have braved through the horrors of baron geddon bombs kamikazi's and defear ragnaros in a 40m lfr at max level druing a 10th anniversary event. Warning: Does not come with a Surger. Можно получить только в течении десятилетней годовщины игры (с 18 ноября по 2 декабря 2014) победив Рагнароса в новой версии Огненных Недр(40) в режиме поиска рейда, так же за вход в игру в этот период вы получите Пылающий корги. 3d модель этого маунта работает пока что только по ссылке. Mount reward for completing the 40 man LFR version of Molten Core during the WoW's 10th Anniversary 10. Geburtstag von WoW. Upon completion of the raid the player will be rewarded a helm for their armor type and Kernhundkette which teaches the mount Kernhund. Ilevel 615 required to que for Molton Core LFR. Other rewards for the WoW's 10th Anniversary include the Geschmolzenes Kernhündchen for logging in during the event (21 November, 2014 to 6 January, 2015). Repeat runners of the Molten Core LFR have a chance to receive the Illusion: Flammen von Ragnaros enchant illusion and the battle pet Hassfunken junior. Source https://twitter.com/Muffinus/status/509823441088679936 These do not have a guaranteed drop rate so more than 2 runs may be required. The Illusion: Flammen von Ragnaros is reusable however. Is the mount for everyone or drop% chance based? Nevertheless gonna be hilarious watching everyone stampeding with those all over Draenor. With the servers lock and high queues, I hope they extend the period of time that you can run this event. Don't get confused when you can't find the mount in your bags. You will get the mount in a mail. I can confirm that this event does require you to kill all of the bosses to spawn Ragnaros - it's a full MC run, and it's not split up into wings. Be prepared to be here for a while! We wiped more on trash than we did on bosses - You still need to be careful with the pulls, dispells, etc. Just to mention that you can mining while riding this mount. Acquiring this item gives a whole new meaning to "LOOT THE CORE HOUND!" Goes to your mail upon Ragnaros kill. This mount is no longer available. It was only obtainable during WoW's 10 year celebration event by killing Ragnaros in the retro 40-man raid via raid finder. Well after trying to get the mount since WoD release and not once was I able to get a group going or get the raid queue for it to come up..just sitting in queue for hours. Restarting it didn't help either. So I suppose I will be one of the few that blizzard screwed out of getting that mount by them STILL not fixing the raid/dungeon finder queue. It is BS like this that I will be glad my game time is up in a month and will not be renewed. This mount is no longer available due to the closure of WoW's 10th anniversary. In 5 years you'll see all the hipsters riding this mount. Mount has just become available on the black market auction house on Alleria EU, with a starting bid of 20k. So, the tag that it is no longer obtainable in game is no longer valid. As of Patch 6.2 (Jun 23, 2015) Kernhundkette Is availble on the Black Market Auction House. If you missed Blizzard's 10 year anniversary, keep your eyes peeled. See Wowhead's BMAH Guide for information. Why? why this and not the Dark portal toy? Just got this bad boy today from an unclaimed black market container. Cost me 40k, best gold I've ever spent. So awesome. The happiness is quite tangible. Just got this today for 38k in the Black Market Auction House on Lothar. So s t o k e d .....because I missed the Blizzard Anniversary events. Available TODAY on BMAH on Draenor-EU, so it is actually still obtainable in-game.. Does getting this from the BMAH reward the Feat of Strength? I was pretty surprised to see this mount on BMAH this day that's possibly the first time on my server but Majordomo Executus appeared to have one spare that he wanted to share with us and indeed it proved to be very popular given its high sell price! Probably the best mount ever made by blizzard. Like, the most valueable and everything.